In a 1988 Fresh Air interview, the late author Elie Wiesel, a Holocaust survivor, explained why he wrote Night, his memoir. "I knew I would have to bear witness," Wiesel said. "Others who are trying to speak about the subject occasionally are false witnesses. And I felt that I had to be a true witness." 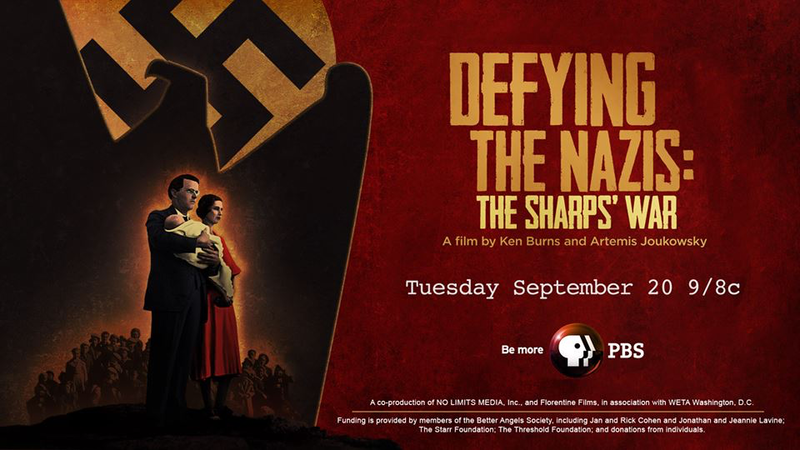 The new Ken Burns-produced documentary Defying the Nazis: The Sharps' War tells a powerful story through the words of witnesses of the Holocaust. 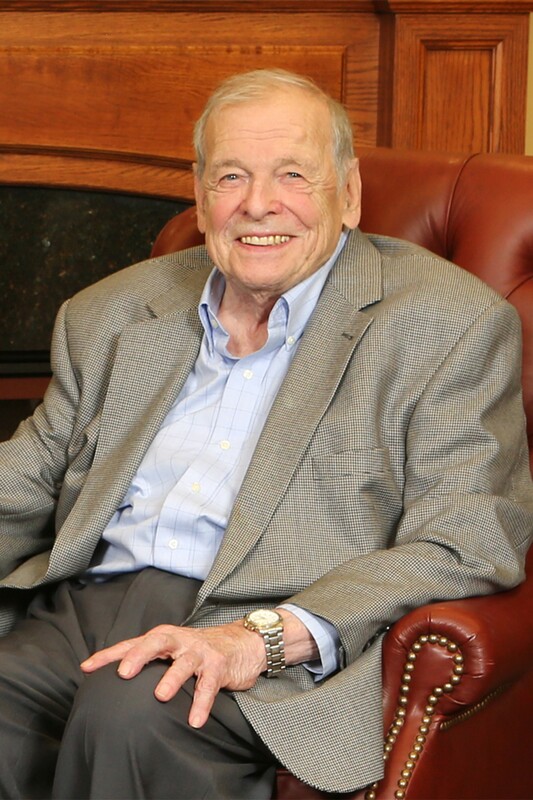 Peter Braunfeld is one of them: he's an 85-year-old Jewish Holocaust survivor who immigrated to the United States in 1940, settled in Chicago, and currently resides in Champaign. Defying the Nazis is codirected by Burns and Artemis Joukowsky (one of the Sharps' grandchildren); its focus is Rev. Waitstill Sharp, a Unitarian minister in Wellesley, Massachusetts, and his wife Martha, a social worker, during their covert mission to rescue Jews, refugees, and dissidents from Nazi-occupied Europe at the outset of World War II. The documentary is largely told through the Sharps' handwritten letters and journal entries, narrated by Tom Hanks as Waitstill and Marina Goldman as Martha, in addition to on-camera interviews with Holocaust historians, the Sharps' two adult children, and the now-adult refugee children whom the Sharps helped to save, Braunfeld included. However, when I spoke to Braunfeld by phone earlier this month he said that he didn't know about the Sharps' involvement in getting him, his mother, and his father out of Prague in 1939 until he was contacted by one of the film's previous directors. "About seven years ago," Braunfeld says, "I got a phone call out of the clear blue sky from a woman who asked me if I happened to know a person named Fritz Braunfeld, who may have been living in Prague in the summer of 1939. And I said, 'Yes, indeed I know that person. That's my father.'" The caller was Deborah Shaffer, a filmmaker who Braunfeld says "told me a little about the Sharps, said she was making a film about them, and asked if she could interview me and include my story as part of that film." Shaffer ultimately left the project; but a few years later, Joukowsky, one of the executive producers, called Braunfeld with an update. "He said he had contacted some eminent people like Ken Burns and Tom Hanks to remake the film, to make a new one," Braunfeld says, "and that he would like me to participate in that remaking." Braunfeld was born in Vienna, Austria, on December 12, 1930. His father, Fritz Leopold Braunfeld, was a successful attorney, and his mother, Johanna Braunfeld, was a French teacher who also worked as a bookkeeper at her husband's law firm. As an only child, Braunfeld was brought up in an upper-middle-class household with two live-in servants. He was raised Jewish, though he and his parents were not particularly observant. In the spring of 1938, when Braunfeld was seven years old, Germany annexed Austria into the Third Reich. Fearing for their lives, the Braunfelds relocated to Prague, and when the Nazis came there, escaped to London. In the late summer of 1940, when Braunfeld was nine, he and his mother took a train to Glasgow, Scotland, during an air raid so they could board a ship to New York City. There they reunited with Braunfeld's father, who had briefly been held in a work camp for Jewish refugees outside of London; he was escorted to the dock by two British bobbies minutes before the vessel was set to depart. Together they sailed across the U-boat-infested waters of the Atlantic Ocean to arrive in New York Harbor, where Braunfeld remembers looking up, awestruck, at the Statue of Liberty and out at the glittering city lights. Braunfeld says his mother didn't want them to end up in New York, because "that's where everyone ended up," so she chose the only other city she knew of in America: Chicago. Though he was a small child when the Nazis invaded Austria, Braunfeld's memories of that time are vivid. He recalls, "very distinctly," his parents taking him aside one day after the Anschluss and telling him to keep a low profile. "I was never to stand out," Braunfeld says. "I was never to argue with anybody, and if an 'Aryan' kid took one of my toys or wanted one of my toys, I should just give it to him and be quiet about it." Though his parents did not explain why he had to be inconspicuous, "it was clear," he says, "that we were now members of a persecuted people." "I knew we had become a part of Germany," Braunfeld continues, "because my school report cards had pictures of the Austrian eagle on them before—and after, they had swastikas on them." He saw German officers forcing Jews to scrub the sidewalks outside of his apartment. He heard rumblings about a camp called Dachau, and how the Nazis were sending Jews there. 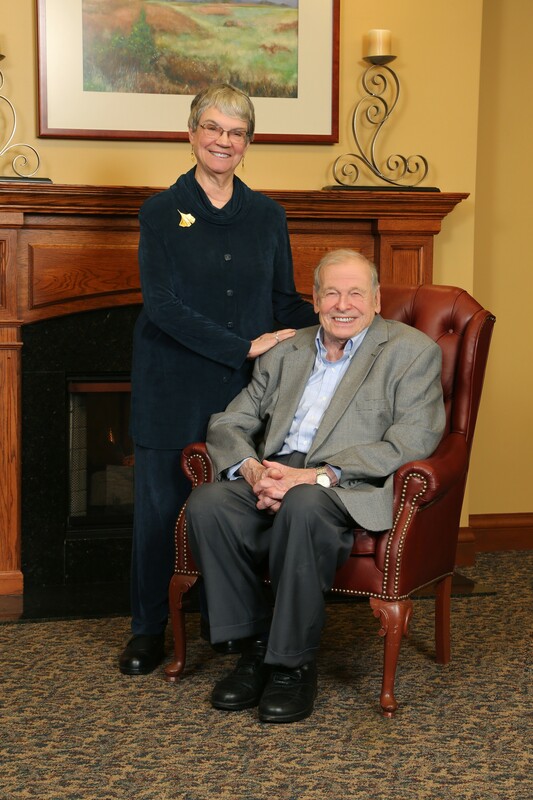 Braunfeld also remembers going with his nanny to his dentist's office, who was well-known in the city—"We were well-off," Braunfeld says, "so we could afford the best"—and seeing "a big sign" on the door that read, We no longer treat Jewish patients. After a pause, he told me, "That stuck in my head." Still, he was quick to add that the dentist was also an adjunct professor at the University of Vienna, and was probably told by the Nazis to stop treating Jewish patients if he wanted to keep his position. "It's easy to sit in Chicago or Champaign and point fingers at people," Braunfeld says. "But it was tough on a lot of people in a lot of different ways. . . . People didn't want to lose their jobs." The Braunfelds left Vienna for Brno, Czechoslovakia, legally and with most of their possessions, in the summer of 1938. 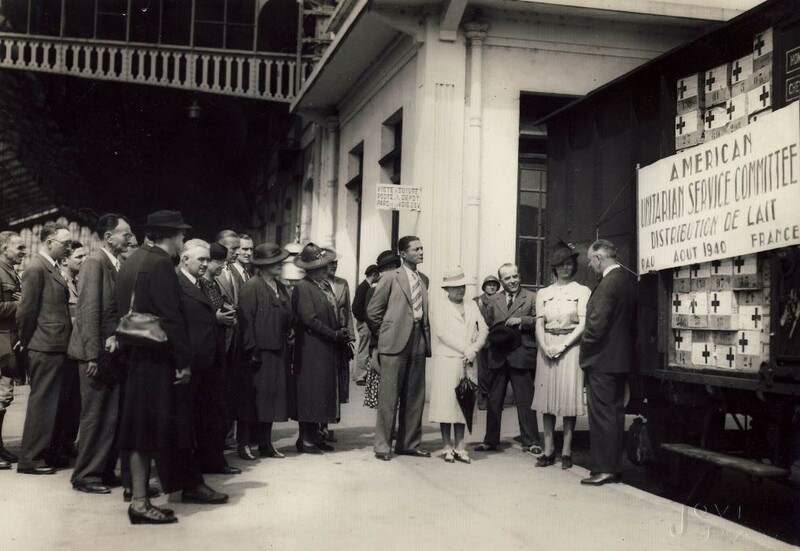 However, when Brno was ceded to the Nazis as part of the Munich Agreement in September, the Braunfelds took a night train to Prague, where they remained, with dwindling resources, until the Nazis closed in on the city the following year. Braunfeld says "it's possible" that Waitstill Sharp helped his father while the family was still living in Prague. Before being reinterviewed for the documentary, "I had been going through some of my parents' stuff, and I actually found, to my amazement, a handwritten note with Waitstill Sharp's name, a date, and my father's passport number on it," he recalls, "and an eight-line form that my father filled out, which indicates that he definitely did go to the Sharps' office in Prague, obviously seeking help. But that's the only physical evidence that I have indicating a connection to the Sharps." Braunfeld mentions that his parents, who died in the late 1970s, had always told him that it was the American Friends Service Committee, a Quaker organization, that had helped them; and, indeed, the AFSC had paid for the Braunfelds' passage from Britain to the United States. "But then it was pointed out to me by Artemis [Joukowsky] that the Friends Service Committee and the Sharps worked hand in glove together in Prague," Braunfeld says. "The Sharps made very sure they destroyed records as soon as they came into being, because they didn't want them to fall into the hands of the Gestapo," he continues. "What I do know is that the Sharps must have been well-known in Prague, and that my father must have heard of them and tried, among other avenues of escape, to see if they could help him." In the documentary, Braunfeld describes his nerve-racking escape from Prague: a passage that Martha Sharp may have coordinated with members of the Quaker underground, as they often worked together, in Martha's words, to "smuggle refugees through the heart of Nazi Germany." "There was this problem," Braunfeld says, "How do you get from Prague to London without going through Germany? It is essentially impossible." Braunfeld and his parents had no choice but to take a train from Prague through Germany to reach the Dutch border. Once there, the German officers separated the men from the women, and Braunfeld didn't know if he'd see his mother again. The officers thoroughly examined each person, and when they got to Braunfeld's father they asked about the ring on his finger. He told them it was a wedding ring, and they took it from him. "Shortly after the train pulled out of the station, an SS man came," Braunfeld continues. "And I remember that—it was a very dramatic thing—we had the joy of riding with an SS man for six hours. I was sleeping most of the time, and my mother was terrified. If I was to kick him or something, it would be the end of us all." Thankfully, the Braunfelds made it to Holland. "I remember my parents being ecstatic," Braunfeld says. From there they traveled by boat to London, and a year later, to America. On the day before his father was escorted to Glasgow, Braunfeld told me, the camp commander called his father into his office. According to his father's account, the commander said: "'Well, I apologize for what happened to you. This is not the way the British are, generally. It's a very difficult time for us. The Germans are only 12 miles away from Britain, and we feel we have to be safe,' and then he said, 'I'm sure your stay with us has not been a Midsummer Night's Dream.'" "And my father, who was also European and college educated, had the presence of mind to respond with, 'I understand completely. And I hope it was not The Taming of the Shrew for you.'" 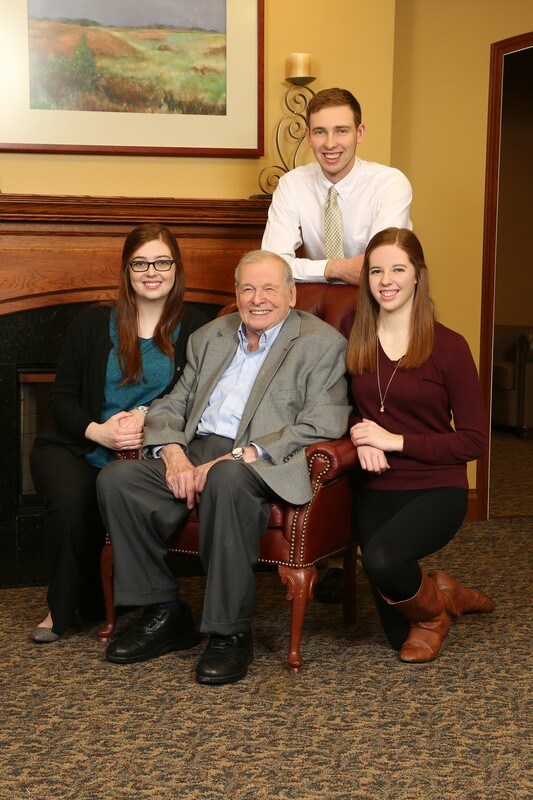 After arriving in the U.S. and settling in Chicago, Braunfeld and his parents thrived. His father went to law school again and became a practicing attorney in Chicago as well as a professor of law at John Marshall. 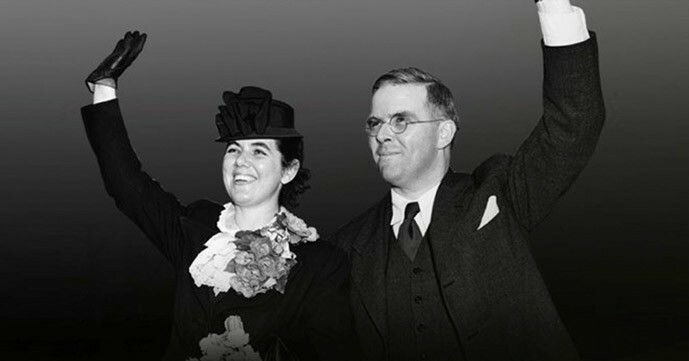 Later the family moved to Urbana-Champaign, where Braunfeld's mother taught French and German at the University of Illinois for more than 20 years. Braunfeld received his PhD in mathematics (abstract algebra) from the University of Illinois at Urbana-Champaign in 1959. For 38 years he was a professor of mathematics at the university, retiring in 1997 with the rank of Professor Emeritus, both in mathematics and in education. Braunfeld provided a lengthy recorded testimony to the USC Shoah Foundation, founded by Steven Spielberg, nearly ten years ago, and said he was initially reluctant to do another on-camera interview about his past. "I didn't want to tell my story again," he says, "and I wouldn't have, if it hadn't been for Artemis saying, 'If you tell your story again, it will be in a film with Tom Hanks, made by Ken Burns.'" He laughed. "That's something that's hard to turn down." Defying the Nazis: The Sharps' War screens on Wednesday, September 7 at 6 PM at Jones College Prep High School in Chicago. The free screening will be preceded by a book signing with Joukowsky at 5 PM and immediately followed by a panel discussion that will include Braunfeld and Joukowsky. This generation did not live through it, but they carry its burden just the same. They feel that their days on earth have to count in extraordinary ways—that they live not so much for themselves as for their parents, who survived the ultimate evil.